Microsoft has decided to change Dynamics logos in the spirit of “One Microsoft” idea. This change has made on July 30. 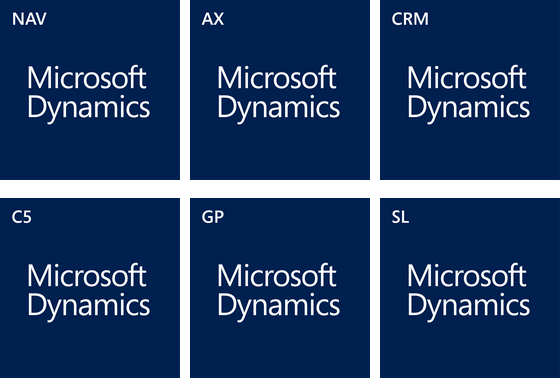 All partners have to use these new logos when represent Microsoft Dynamics logo and solutions. All directions are in the Product Tile Usage Guidelines. On some places on internet, you can find a small mistake. You can find “CS” instead of “C5”. This error is most likely caused on MicrosoftDynamicsPartnerGuidelines.pptx (slide 21) from Partner Source. But, you can find actual logos on this page on Partner Source: https://mbs.microsoft.com/partnersource/northamerica/sales-marketing/branding-guidelines-logos/MSDY_BoxShots. You can download all of them as PNG or EPS. I hope, Microsoft will correct this small mistake in document, because this pptx is very useful. You can find a lot of additional helpful information here.